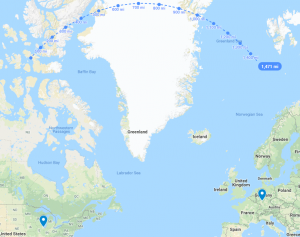 Back in October, we published a blog post introducing you to Google MyMaps, an easy way to display simple information in map form. Today we’re going to revisit that topic and explore some further ways in which MyMaps can help you visualize different kinds of data! One of the most basic things that students of geography learn is the problem of projections: the earth is a sphere, and there is no perfect way to translate an image from the surface of a sphere to a flat plane. Nevertheless, cartographers over the years have come up with many projection systems which attempt to do just that, with varying degrees of success. 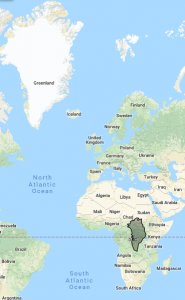 Google Maps (and, by extension, Google MyMaps) uses perhaps the most common of these, the Mercator projection. 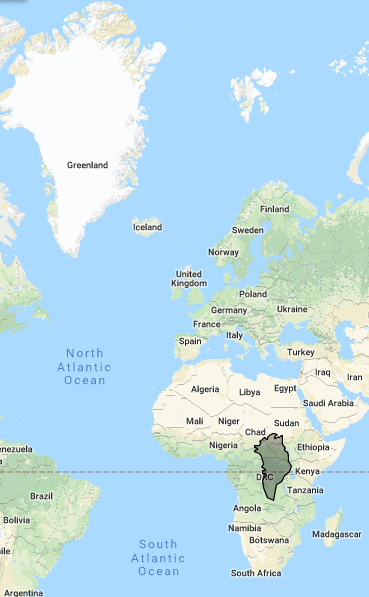 Despite its ubiquity, the Mercator projection has been criticized for not keeping area uniform across the map. This means that shapes far away from the equator appear to be disproportionately larger in comparison with shapes on the equator. Now it’s time to create a more detailed outline. Click and drag your shape over the area you want to outline, and get to work! You can change the size of your shape by dragging on the points at the corners, and you can add more points by clicking and dragging on the transparent circles located midway between each corner. 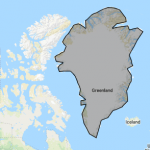 For this example, I made a rough outline of Greenland, as you can see below. You can get as detailed as you want with the points on your shapes, depending on how much time you want to spend clicking and dragging points around on your computer screen. Obviously I did not perfectly trace the exact coastline of Greenland, but my finished product is at least recognizable enough. Now for the fun part! 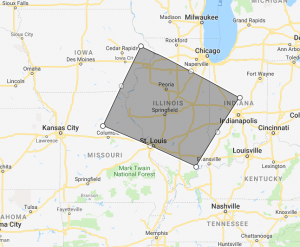 Click somewhere inside the boundary of your shape, drag it somewhere else on the map, and see Mercator’s distortion come to life before your eyes. The curve in this line represents the curvature of the earth, and demonstrates how the actual shortest distance is not the same as a straight line drawn on the map. This principle is made even more clear through using the Measure tool a little farther north. The beginning and ending points of this line are roughly directly north of Chicago and Frankfurt, respectively, however we notice two differences between this and the previous measurement right away. First, this is showing a much shorter distance than Chicago to Frankfurt, and second, the curve in the line is much more distinct. Both of these differences arise, once again, from the difficulty of displaying a sphere on a flat surface. Actual distances get shorter the closer you get to the north (or south) ends of the map, which in turn causes all of the distortions we have seen in this post. How might a better understanding of projection systems improve your own research? What are some other ways in which the Mercator projection (or any other) have deceived us? Explore for yourself and let us know! This entry was posted in Data Services, GIS, Tools and tagged GIS, Google, Google MyMaps, MyMaps, tools by Michael Robert Cummings. Bookmark the permalink.